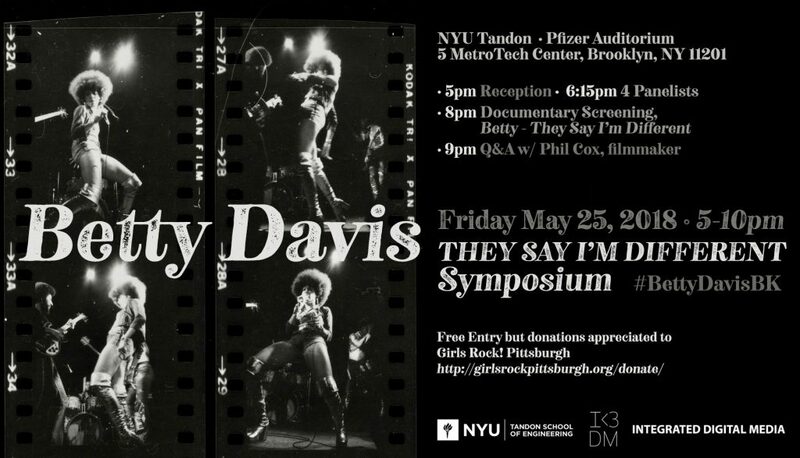 On Friday, May 25, 2018, I had the honor and privilege of organizing and curating the Betty Davis – They Say I’m Different Symposium at NYU Tandon Pfizer Auditorium in Brooklyn will celebrate funk legend, Betty Davis. The symposium consisted of a panel moderated by Fredara Mareva Hadley (Oberlin) with talks by myself, Kwami Coleman (NYU Gallatin), Emily Lordi (University of Massachusetts, Amherst), and Greg Tate, writer, musician, and cultural provocateur. The talks were followed by a screening of the new documentary, Betty – They Say I’m Different and a Q&A with the filmmaker, Phil Cox. This entry was posted in news and tagged Apollonia 6, Betty Davis, Joi, Miles Davis, prince, Rick James, Vanity 6, Whild Peach. Bookmark the permalink.